They are currently “renovating” the bathrooms on my side of the building. It will be interesting to see what happens with the renovations. Will the snot on the walls be cleaned off prior to painting or merely be painted over? Curious minds want to know. Will the stalls be replaced with non-rusted stalls? I hear that they are going to be putting in new tile for the floor, but I have heard nothing else. Oddly enough, they are not currently renovating the worm infested bathroom. That restroom is available for use by all. No one uses it, but it is available. So it at least has that going for it. I am currently one of those people in the office who should be avoided lest someone wants the horrible sore throaty sickness that has been going around. I have been doing my part though. I cough when I can and touch as many surfaces with my un-washed hands as much as possible. Gimme a break, I can’t use the sink that is less than 20 feet (a tad over 6 meters for my metric fans) away from me. I am not going to walk all the way across the building to wash my hands after every cough when I can easily wipe them on door handles and my co-workers’ desk surfaces that are soo close by. Yes, Misery loves company and Misery sounds like a horse voice and feels like a brick in your head. Thought you should know. I am not really one of those people who coughs on everything and smears my germs on co-workers’ desks maliciously. I am one of those people who coughs on everything and smears my germs on co-workers’ desks in a spirit of fun. I need more of that Purel crap for my desk. I really do not want to get my co-workers sick. Well, most of my co-workers at least. I have a list of ones on which I wish mild maladies (I’m looking at you ACW!). That is all I got today. I am afraid that tomorrow my furry friend will have taken up residence in my skull again. Stupid cold with its stupid sore throat! 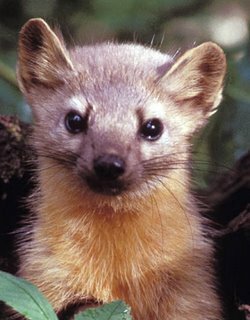 In "Pine Marten in tha House"